Owned and loved by Robin & Keith Mahoney. Trained and handled by Robin. Sharon and Steve Dattilio would like to welcome you to the Shomberg GSP web site. We sincerely hope that your visit with us helps to answer some of your questions about German Shorthaired Pointers. We also want to give you some insight into the various aspects of how we came to be "Shomberg" and why we consider our genuine love and respect for the breed so very important to its future. We are thrilled to have so many brags and great pictures to share from the 2007 GSPCA National Specialty Show & Futurity, in Ft. Mitchell, KY.
We are so very proud of every Shomberg puppy, and dog, and we would like to express our sincerest appreciation to each and every owner who allowed their dog to be showcased at this prestigious event to represent SHOMBERG. under respected judge, Mr. James Reynolds. thankful to Patty who presented her so beautifully. 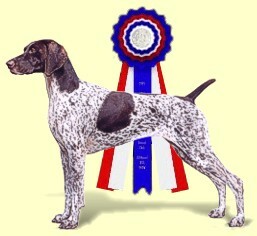 See Monroe highlights from 2005.
by the German Shorthaired Pointer Club of America. Click a news item headline for details. 04/23/2019 2019 Keely & Bowie Litter Announcement! 04/17/2019 With great sadness we share Heiden's passing. 01/01/2019 With a heavy heart we say goodbye to Rockwell. 10/18/2018 Update! - Largo & Ohanna Puppies Born! 11/29/2017 "Shomberg's Celebrate The Season" Litter Is Born! -- Piper & Draco 2017! 01/25/2016 With sadness we note the passing of Shomberg's Viking, "Grady"